Ring in the holiday season with the Virginia Glee Club as we present our 78th consecutive year of holiday concerts in the University and Charlottesville communities! One of the area’s oldest and most joyful holiday traditions, the Glee Club sings unique renditions of your yuletide favorites and brightens your winter’s night with the season’s bounty of beautiful music. 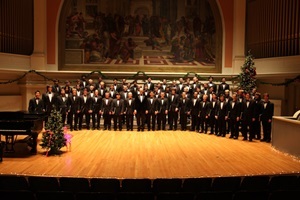 To make a tax-deductible contribution to the Virginia Glee Club, click here.